The itemized view of purchases added are displayed in this page. Go to PROCUREMENT -> ITEMS to view items list. Use search tab to view the purchase details for a particular SKU. By default, purchases that gets displayed is for last 30 days. You can change the date range using filters. 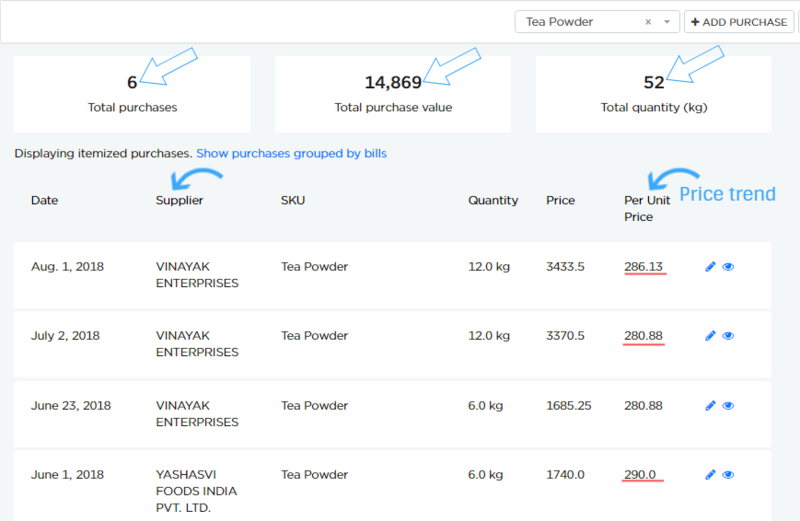 In the above example, you can see purchases details for "Tea Powder"
Total purchase made and its respective total value is displayed. By this you will know the amount spent on each SKUs. Total quantity purchased is also displayed, through which you will know its consumption for the selected date range. In case of multiple suppliers, the price of an SKU might differ. As you can see in above example, the price of "Tea powder" purchased from "VINAYAK ENTERPRISES" on month of August is more compared to July. Similarly, the price of "Tea powder" purchased from "YASHASVI FOODS INDIA PVT. LTD." on month of June is comparatively high when compared to other purchases. By this you will know the price trend of SKUs.